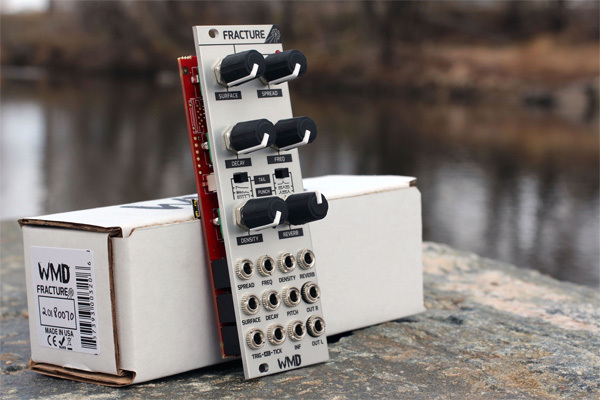 Initially inspired by audience applause, hip-hop samples, and classic drum machines, Fracture is much more than another percussion module or ‘sample player’ for expanding Eurorack modular system setups since it uses granular synthesis techniques to generate a wide palette of sounds while maintaining a simple, intuitive interface. In itself, that’s no small feat. For granular synthesis is a technique that operates on the microsound time scale (specifically shorter than one tenth of a second and longer than 10 milliseconds, including the 20 Hz to 20 kHz audio frequency range and the infrasonic frequency range below 20 Hz); based on the same principal as sampling, samples are not conventionally played back, but split into smaller segments or grains (of around one to 50 milliseconds) that may be layered on top of each other, played at different speeds, phases, volume, and frequency (amongst other parameters). Proprietary micro-samples — specifically recorded for this purpose by WMD — is where it all starts for Fracture. It ends with an engine built to suit those samples, ultimately. Unlike WMD’s first Eurorack percussion synthesizer module, Chimera, which involves impulse-rich samples at its tonal centre, Fracture uses single-impulse samples such as claps, ping-pong balls, opening a beer can, and many more. Moreover, it then plays back a group of similar such samples in a pseudo-random order resulting in unique hits. DENSITY, DECAY, and TAIL settings all affect tone and how ‘tight’ the user’s virtual clappers are to playing together. Trying to design a clap percussion module with wide-reaching range — from classic drum machine claps all the way to full audience applause — was WMD’s definitive design goal for Fracture. Fortunately, Fracture exceeded expectations, ending up as a module capably covering an amazing array of timbres that reach way beyond the scope of claps. Fracture features a number of other outstanding sound-sculpting tools packed into its slender (8HP width) frame, including a stereo output (OUT L and OUT R); built-in H (Hall) and R (Room) REVERB; two trigger inputs for different sound types — TRIG triggers a burst of particles and TICK triggers a single particle (independently of the TRIG input); three types of filter; three types of envelope; and a free-running, voltage-controlled ‘applause’ capability. CV (Control Voltage) over all parameters is also available of course. Creating singular-sounding percussion that fuels fire for the ever-expanding Eurorack world is perfectly possible with WMD’s latest (multi-particle percussion synthesizer) module. Making room for Fracture is surely space well filled and money well spent! Shipping now, Fracture is available to purchase through WMD’s growing global network of authorised dealers with an MSRP of $269.00 USD.